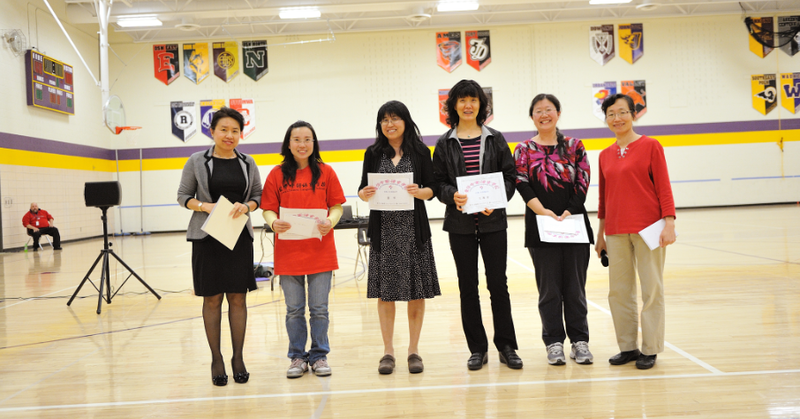 The Iowa Chinese Language School (ICLS) 2013~2014 school year closing ceremony was held on May 18, 2014 in Johnston High School. About 200 people, including teachers, students, parents, and grandparents attended the ceremony. Ms. Zhang, Qingyuan, ICLS advisory council member and director of Global Trade Finance at John Deere Credit Financial joined us and presented awards to the teachers, students and volunteers. Iowa Chinese Language School has been continuously growing ever since it was founded in 1999. It has attracted more and more people in the Des Moines and surrounding areas, who are interested in learning Chinese. ICLS school principle, Emily Wu, gave a brief update during the ceremony. The success of ICLS is are greatly benefited from the contributions from the teachers, volunteers, supports from students and their parents, and the efforts from the school board members. The growth of the ICLS is also benefited from the supports of the local communities and businesses, especially those from Johnston Community School District and Johnston High School. The closinge ceremony was then followed by wonderful performance from the students of the 16 classerooms. ICLS 2014 Fall semester will start in mid-August. Details will be sent out by email in July. ICLS wish everyone a wonderful summer!